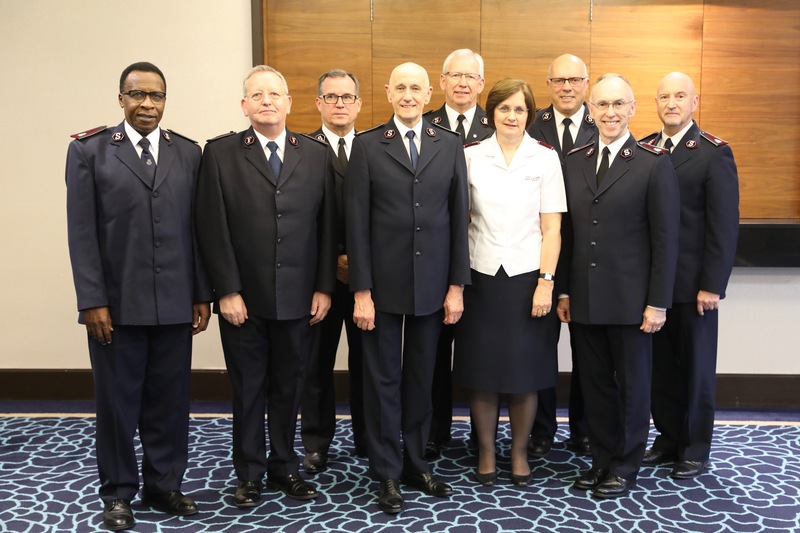 TUESDAY morning began with nominees indicating whether they would accept or decline their nomination for election to office as General of The Salvation Army. Five individuals accepted the nomination (see Report 4) and these candidates, and spouses, left the council to prepare the answers to the questionnaire and write their speeches. The council then reconvened to elect a new President to replace Commissioner William Cochrane, who had to step down from the role as a result of accepting nomination. This resulted in another historic moment for a High Council – Commissioner Birgitte Brekke-Clifton being elected the first woman to take this office. Commissioner Clive Adams (Territorial Commander, Sweden and Latvia) was elected as Vice-President. The final business of the day was to consider questions to be addressed to individual candidates. Those submitted by members were considered, reviewed and accepted or rejected by the council. The morning concluded with the Chaplain leading members in the singing of 'Thou Christ of Burning, Cleansing Flame'. Commissioner Mark Tillsley (International Headquarters) prayed for the candidates and spouses – 'our brothers and sisters' – who were placing their lives on the altar in a very real way. Speaking to a group of married women High Council members, Major Christine Clement asked what the nomination of the 'first' married woman meant to them. The response was far ranging: it gives them dignity was one answer; it empowers them; it shows confidence in women; it is a great example to all women and emphasises that The Salvation Army is focusing on its (married) women officers as leaders. Similarly, asking about the nomination of Commissioner Benjamin Mnyampi, a Tanzanian and from one of The Salvation Army's youngest territories, the response was that it was 'good for we Africans', showing that they are ready to be considered for such a level of leadership. Finally, on a day of firsts, Commissioner Cochrane became the first single male officer to be nominated, almost 90 years after the first single woman was a candidate for the office of General – Commander Evangeline Booth. However, as much as there may be interest in the firsts and interesting facts from the 19th High Council, they will not be important when it comes to the election process. As it says in Proverbs: 'The lot is cast into the lap, but its every decision is from the Lord' (16:33).